The 3rd Infrastructure and Transport Conference will take place at the Megaron Athens International Conference Center (ΜΑΙCC), one of the finest and most technologically advanced conference venues in Europe. Situated in the city center yet surrounded by its own extensive landscaped gardens, Megaron offers a stunning environment, exceptional aesthetics, cutting edge technology and unrivalled client service. 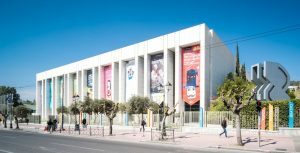 MAICC is situated right in the heart of Athens and is easily accessible by metro, bus and trolley bus. It is also located at a walking distance from many hotels. You can find scattered all around the area dozens of restaurants, coffee shops, bakeries. Giving the fact that MAICC is located next to Athens City Center you can visit many of the city`s museum including one of the worild famous museum: the Acropolis Museum. MAICC is accesible from the airport, the railway station, the port and the city center, exit at the metro station “Megaron Moussikis” of Metro Line 3 (blue line).